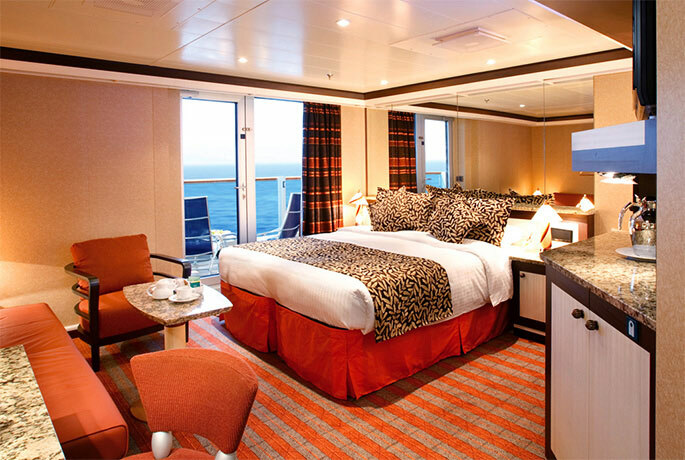 Inside Staterooms have two twin beds that convert to a queen-sized bed, flat screen television, generous closet space, desk,private bathroom with shower. 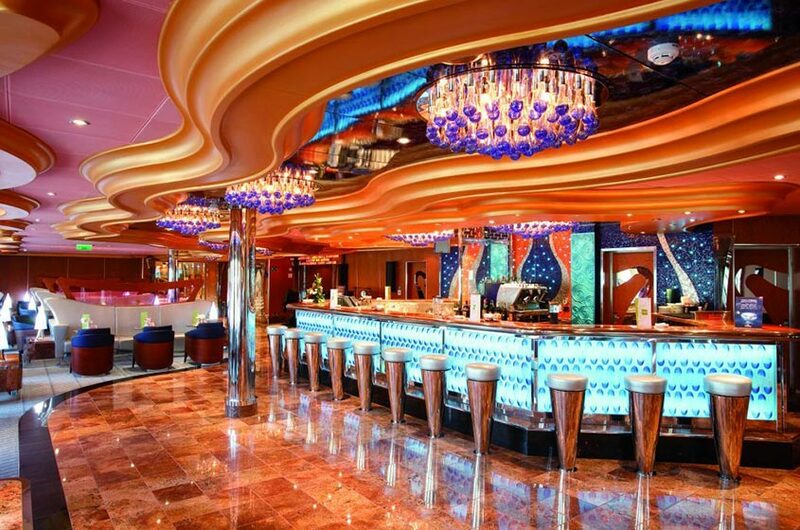 Each stateroom also has PlayStation on demand, satellite television, thermostat controlled air-conditioning, direct-dial telephone, hair dryer, mini bar, individual safe,24 hour room service. 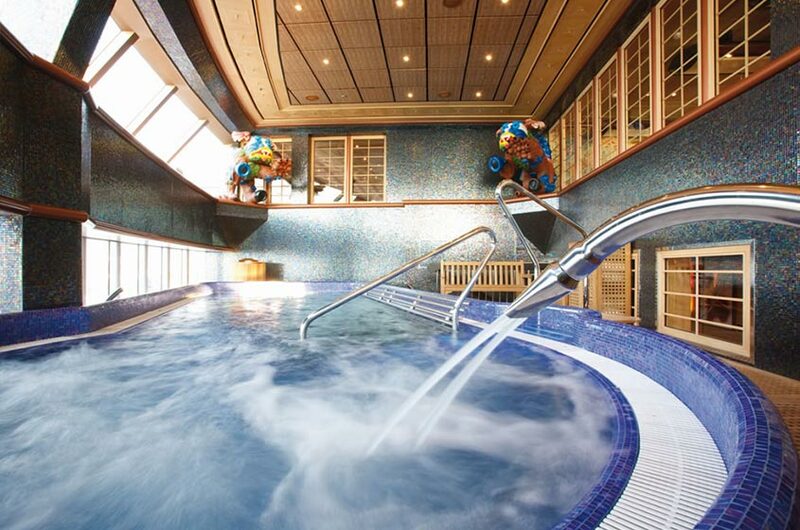 A relaxing retreat with discreetconvenient access to the largest spa at sea. Samsara Inside Staterooms have two twin beds that convert to a queen-sized bed, flat screen television, generous closet space, desk,a private bathroom with shower. 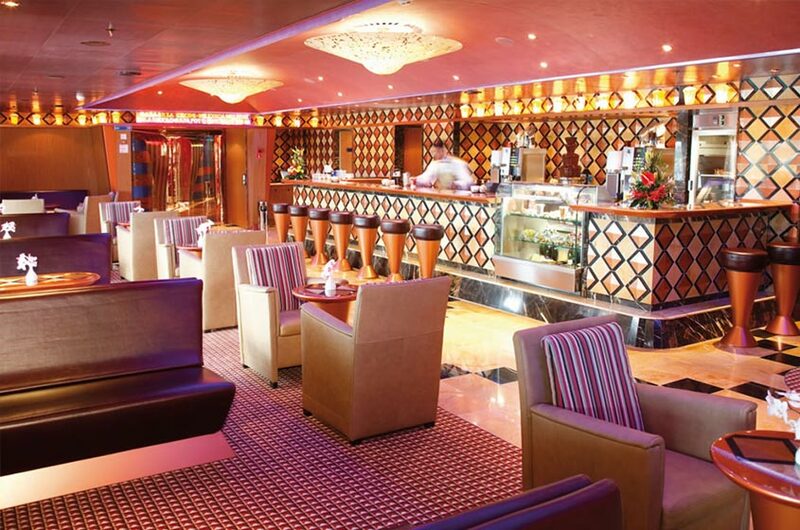 Each stateroom also has PlayStation on demand, satellite television, thermostat controlled air-conditioning, direct-dial telephone, hair dryer, mini bar, individual safe,24 hour room service. 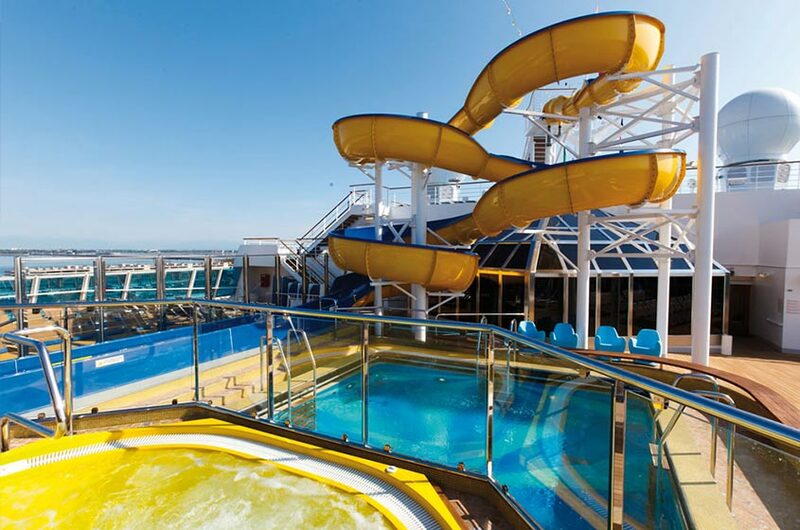 A relaxing retreat with discreetconvenient access to the largest spa at sea. Samsara Balcony Staterooms have two twin beds that convert to a queen-sized bed, flat screen television, generous closet space,a private bathroom with shower. There is a sitting area with desksofa bed. Floor-to-ceiling sliding glass doors lead to your spacious veranda with seating. 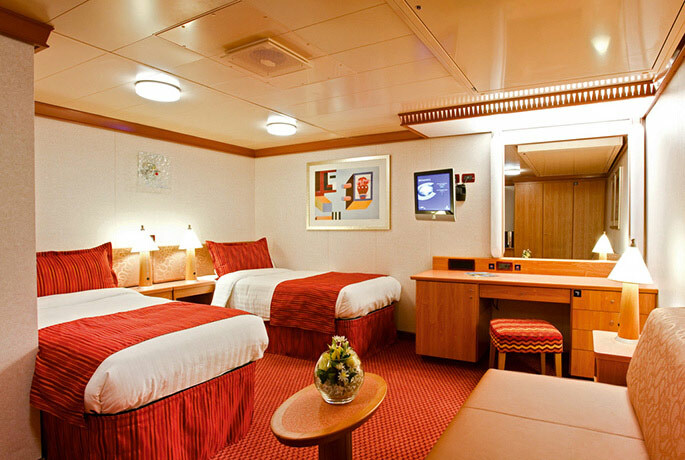 Each stateroom also has PlayStation on demand, satellite television, thermostat controlled air-conditioning, direct-dial telephone, hair dryer, mini bar, individual safe,24 hour room service. Grand Suites have two twin beds that convert to a queen-sized bed, flat screen television, generous closet space, private bathroom with double sinkswhirlpool tub,dressing area with vanity. There is a sitting area with desk, sofa bed,armchairs. Floor-to-ceiling sliding glass doors lead to your spacious veranda with lounge seating. 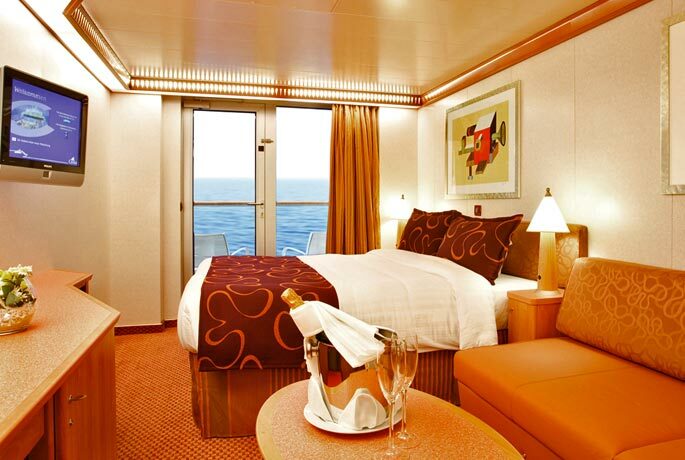 Each stateroom also has PlayStation on demand, satellite television, thermostat controlled air-conditioning, direct-dial telephone, hair dryer, mini bar, individual safe,24 hour room service. Mini Suites have two twin beds that convert to a queen-sized bed, vanity, flat screen television, generous closet space,private bathroom with shower. There is a sitting area with desk, sofa bed,armchair. Floor-to-ceiling sliding glass doors lead to your spacious veranda with seating. 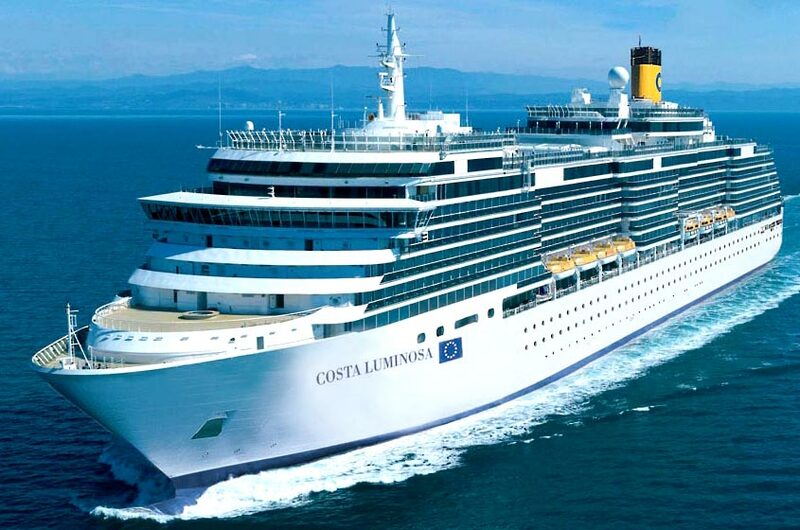 Each stateroom also has PlayStation on demand, satellite television, thermostat controlled air-conditioning, direct-dial telephone, hair dryer, mini bar, individual safe,24 hour room service. Panorama Suites have two twin beds that convert to a queen-sized bed, vanity, flat screen television, generous closet space,private bathroom with double sinkswhirlpool tub. There is a sitting area with desk, sofa,armchairs. Floor-to-ceiling sliding glass doors lead to your wrap-around veranda with lounge seating. 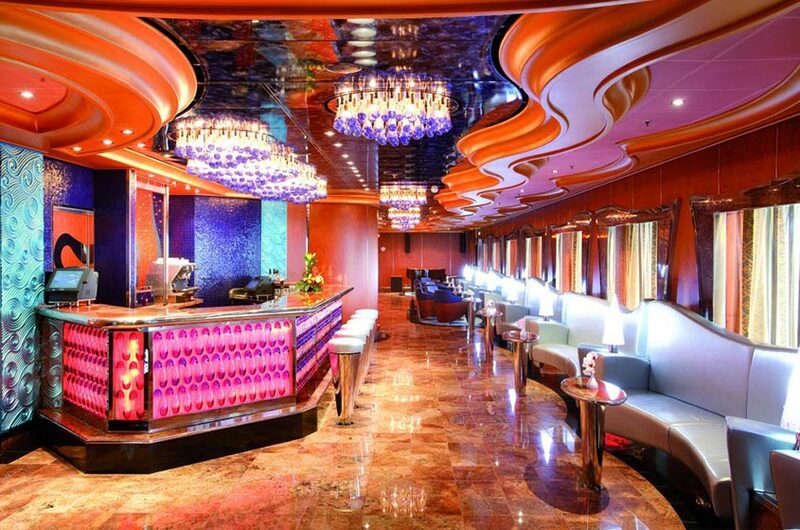 Each stateroom also has PlayStation on demand, satellite television, thermostat controlled air-conditioning, direct-dial telephone, hair dryer, mini bar, individual safe,24 hour room service. Suites have two twin beds that convert to a queen-sized bed, vanity, flat screen television, generous closet space,private bathroom with double sinkswhirlpool tub. There is a sitting area with desk, sofa bed,armchairs. Floor-to-ceiling sliding glass doors lead to your spacious veranda with lounge seating. 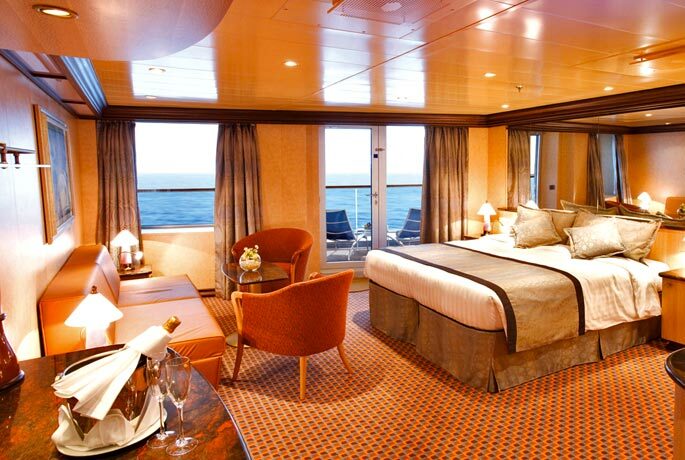 Each stateroom also has PlayStation on demand, satellite television, thermostat controlled air-conditioning, direct-dial telephone, hair dryer, mini bar, individual safe,24 hour room service. The suite is cleanes twice a day, the bed sheetstowels are changes regularly, the cabin is equipped with a private bathroom with a shower, air conditioned, TV, minibar, strongboxhairdryer. 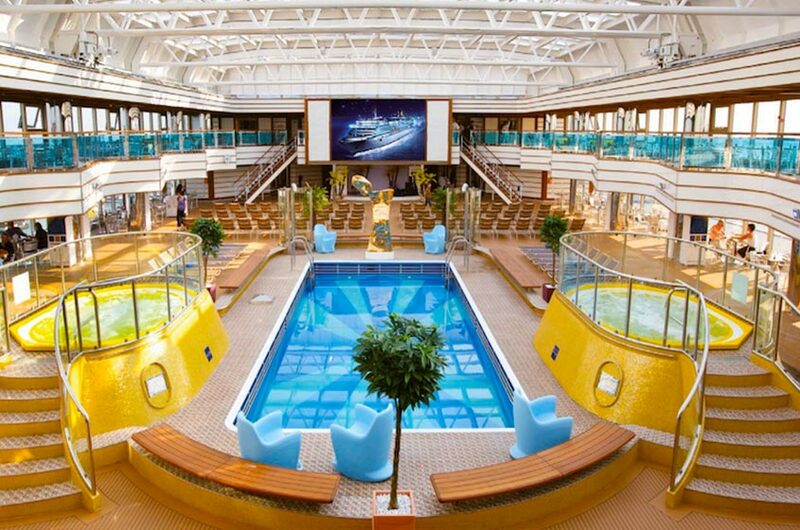 Direct access to the Spa, access to the thermal area, the thalassotherapy poolto the relaxation area, towelling robeslippers, a special bathroom kit, purifying shower filter, weighing machine, minibarroom service with a light menu (on payment), kettle with a ion of teas to drink in your cabin.